Do you know how to read SQL databases? By “read” I mean really get the most out of the database. If for some reason you were presented with an unfamiliar database containing a lot of tables, would you know what to do? If not, then you are not alone. Many people: programmers, developers and analysts are taught the basics of SQL, they know how to write a SELECT query and can even use JOIN to write queries involving more than one table, but relatively few are shown how to read SQL and interpret the database structure itself. This is a pity, because the structure of a database is often very well documented. What is more, that documentation is incorporated into the database itself. That means that it is available and it is up to date. The problem is, most people don’t look at the database in that way. They concentrate on the content, rather than the structure. When they want to know which tables to look at, they tend to ask the local “expert”. Asking the expert is a good thing to do, but it has a number of problems. The first and most serious problem is “how expert is the expert?” and the second is the problem that the expert may be busy. I was prompted to think about this problem a little while ago when someone asked about “How to ‘dig in’ to a large database” on one of the forums I visit. I gave an answer which several people found helpful and which I documented here in my blog. Over the intervening period I have refined the method I described and reduced it to something I call “DOGI”. I like simple acronyms. They make things memorable and aid learning. The approach I suggest to read SQL is really quite simple. It starts by getting an overview of the database by using whatever tool you have and then organising the diagram in order to make it easier to understand. This “organised” diagram makes it much easier to recognise groups of related tables which can then be investigated in more depth. This approach makes the investigation process more systematic and easier to plan. I have created a course which teaches this method. I’ve structured it as what I term “an extended tutorial”. I start with one of Microsoft’s example databases and then use the method to investigate it. I surprised myself with how much information I was able to glean. This course is suitable for anyone how can write a simple SELECT statement. By simple I mean “SELECT * FROM TableName”. When you have completed the course, you will have seen the DOGI method applied to one of Microsoft’s databases and will be able to repeat this yourself. 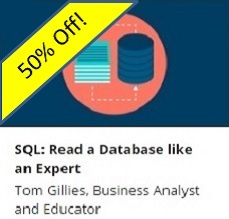 More significantly, when you have completed this course you be able to use the DOGI method to “read SQL databases” and make yourself “the expert”. You won’t have to ask which tables you need to look at, because you will know. You will know what the tables are doing and you will be able to relate them to what the application can and cannot do. I teach using a mixture of lectures and demonstrations. I think you will learn best if you repeat what demonstrate for yourself, but that is entirely optional. 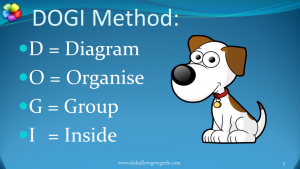 With each step you see the DOGI method applied in practice and build your knowledge using what you have learned already. On-line courses set you free to work at your own pace and to review and revisit material, even after you have completed the course. If I’ve got your interest, then I’ve included links so you can purchase the course at a substantial discount. Go on, have a look now! It’s all supported by a 30 day, no-questions-asked, money-back guarantee too. Previous Previous post: Reward: Make it worthwhile and memorable!